Gabriel Hughes was sentenced to eight years after shooting his attorney and mother. A 31-year-old Grape Creek man who shot his mother and attorney Theodore “Tip” Hargrove in June of last year was sentenced to eight years in prison on Tuesday and given another 10 years probation. Four women sat behind defendant Gabriel Hughes as he stood and pled to his guilt before visiting judge Brock Jones, accepting the terms of a plea deal that had been on the table for roughly two weeks. Hughes was indicted on one count of aggravated assault with a deadly weapon against a family member, a first-degree felony, and one count of aggravated assault with a deadly weapon, a second-degree felony, in August 2014, roughly two months after the incident took place at15202 Sutton Road. On June 3, Hughes was drinking at the residence he occupied alone on Sutton Road, when Tip Hargrove and the defendant's mother, Cathleen Hughes, showed up with the intent to evict and take him to a sober living house. The house on the ranch, where Hughes lived, belonged to his parents, and Hargrove and Cathleen were in the process of calling the sheriff to have Hughes removed when an altercation escalated. Hughes shot Hargrove in the foot; he then turned the AR-15 on his mother, a complaint states, and fired at her, causing serious bodily injury. 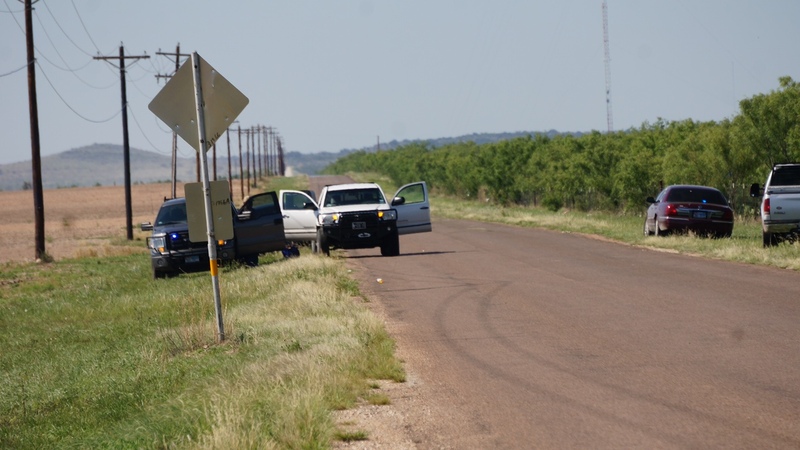 The victims then transported themselves in a Toyota Tundra to a location near the intersection of US 87 and March Road, where they were met by Sheriff’s Deputies. Both were taken to Shannon Medical Center. Back at the ranch, a seven-hour stand off between Hughes and multiple law enforcement agencies ensued, before he finally peacefully surrendered around 11:30 p.m.
During the stand off, officers and emergency personnel from the DPS, SAPD SWAT team, Homeland Security and Grape Creek Volunteer Fire Department attended to assist. Hughes has remained in jail since June 3, and was presented with the plea agreement roughly two weeks ago, defense attorney James Sadler said. He reached the decision to accept the plea last week, and both cases were disposed in what was initially scheduled as a pre-trial hearing Tuesday morning. Attorneys for the state and the defense stated that they had discussed the terms of the agreement with the victims, both of whom were satisfied. At just after 11:15 a.m., Hughes pled guilty to the first-degree felony of shooting his mother, and was placed on 10 years deferred adjudication probation. He was ordered to pay $4,000 in restitution. James Sadler, who was defending Hughes alongside Sweetwater's Trey Keith, said, “…his mom didn’t really want to prosecute this case…or thought he needed some help…” Hughes was reported to have psychological troubles at the time of the incident. His attorney noted that he was under the influence of alcohol when the shooting took place. As for the second-degree offense for shooting Tip Hargrove, Hughes pled guilty and was sentenced to eight years in prison and roughly $4,500 in restitution. Because he has been convicted of a 3G offense, Hughes will have to serve at least half of his sentence before he is eligible for parole. His probation will begin after he is released from prison. Sadler stated after the sentencing that he believed the agreement was fair, not only to the defendant, but to the state and the victims, who had been expressed approval of the plea’s conditions. Sadler, who was court-appointed after the incident, said that Hughes immediately expressed remorse after the shooting and has taken responsibility for his actions. Noting that Tip Hargrove is a defense attorney like himself, Sadler said he didn’t believe the victim’s occupation had any bearing on the case and that he didn’t have any personal feelings toward it. Hughes will receive credit for the eight months he spent in jail prior to Tuesday’s hearing, and will likely be transferred to Abilene before being transported to a more permanent unit. None of the women present at his hearing wished to comment on the sentencing. Chelsea is the head of the LIVE! editorial team and started with the initial publication in 2007 as a features reporter. She graduated from ASU in 2010 and spent three years in Germany as an English teacher at universities in Hannover, before returning to San Angelo to help start up the website. This below bothers me. Someone who is under any influence of any substance or has mental issues needs some type of help. If it be jail or in a mental institution. This is how all the bad things you see people do like Columbine, Denver's movie theater shooting, the shooting in Newtown, etc start. If someone needs help get them help! Don't make excuses for them or try to protect them. "James Sadler, who was defending Hughes alongside Sweetwater's Trey Keith, said, “…his mom didn’t really want to prosecute this case…or thought he needed some help…” Hughes was reported to have psychological troubles at the time of the incident. His attorney noted that he was under the influence of alcohol when the shooting took place." He was getting off of an antidepressant and it did not go well with alcohol, he had some serious delusions. Be careful with those meds!